M y training in Chinese martial arts has brought me from the crowded noisy streets of New York to the silent halls of Buddhist Temples. My first encounter with Buddhism came many years ago in the early days of my training. When I was a young boy attending Kung fu classes in Chinatown, New York, I would always see a small shrine of a Chinese deity ingratiated with flowers and incense as I entered the Kwoon. I paid little attention to this as my only concern at the time was with martial arts and I saw no connection to my training. However, as time passed I began to see that there was a significant connection between martial arts and the philosophy of Buddhism and Taoism. I asked my teacher about this, and he elaborated on some of the more obvious connections (such as having a clear mind and controlling the body). However, I knew that to learn more about this I would have to take a hard look for myself. It would seem I was in the right place to start my search as I lived next to Chinatown. I asked some of my martial arts classmates who were Chinese to direct me to a good teacher. This is how I met my first teacher (see Fig 1) , Rev. Chung Tsai. He had a Temple in the basement of an old five-story building in Chinatown. I found the building my classmates directed me to and entered the main hall. I noticed a sign directing those who were interested in the Buddhist temple to go downstairs to the basement. I entered a darkened room and was met by a monk who greeted me warmly and asked if he could help me. This was the start of my long journey into the world of Buddhism. I was young and raised as a Catholic and had little understanding of Chinese beliefs. In fact, I had never even heard of Buddhism or the Buddha until that day. I explained to the monk that I was studying the martial arts and was curious to find out what Buddhism had to do with this study. He told me of the Shao-lin Temple in China, a Buddhist Temple centuries old where Kung Fu originated. He also said he to liked to play various martial arts. He had experience in PaKua, and Tai Chi. He was also an expert at taking the three pulses. This is a way the Chinese can diagnose various ailments within the body. From that day on, I spent many months visiting the Temple and learning all I could about his martial arts and Buddhism. This came to a quick end when Chung Tsai had to leave. Where he went is a mystery to me to this day. The temple was closed and I was left with many unanswered questions, until I found another Temple which would lead me to my greatest teacher (fig. 2), Ven. Litt. D Master Change Sheng-yen. The Temple was, and still is, located in The Bronx, New York. It is called the Temple of Enlightenment. It was a small but well built Temple where various classes were held for those eager to learn about Buddhism. In fact, this is where I met another great teacher, Franklin Kwong (see article "The Professor of Shadow Boxing" for details of Master Kwong's history) who was also a practicing Buddhist and Taoist. The Temple became my home away from home and I spent all my free time studying various Buddhist concepts, learning sutra, and studying the Chinese language with Loretta Pan (the teacher who gave me my Chinese name, Ma For Ren). Master Sheng-yen came to the Temple of Enlightenment a year or two after I began going there, around 1977. I and a few of my students were among the few Americans who attended the Temple. At that time, it was mainly attended by Chinese. I was lucky to be one of the first American students in his meditation class. Master Sheng-yen changed all of that. Because of his background, he soon became head abbot of the Temple and started to teach in his own special way. He was a different kind of monk. He had innovative ideas. He wanted to open the Temple up for anybody who was eager to learn. As soon as he took over as Abbot, he started new programs for the American people. Of course, many Chinese also attended his programs in Buddhist training. These classes continued for a number of years before the Master decided to move on his own way. The Master however, could not run the Temple in full control, as it was not his own Temple, so he decided to move on and establish his own Temple in Elmhurst, NY. For more on his life, see Background of Sheng-yen. Master Sheng-yen's training at The Temple of Enlightenment began each day between 5:30 and 6:00 AM with sitting meditation. Then, we would have a light breakfast, and proceed to have an in-depth lecture on the Buddhist Sutra, such as the Diamond Sutra. 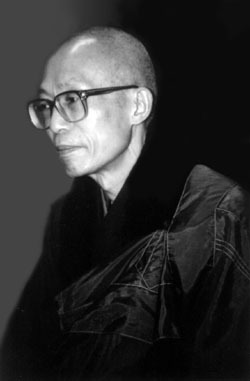 He would teach us how to chant the sutra and explain its deeper meanings. We would then do some maintenance work around the Temple grounds, cleaning or fixing things in need of repairs. This was done as meditative work, in complete silence with total attention to the tasks at hand. The morning went by quickly and we were soon on our way to start a normal day at our various jobs in the world -- only to come back the next day and start again. The Master gave me a Buddhist name, Ch'ang Tao, as he did with each of his students. Periodically, he would call us in to private chambers and explain how he viewed our progress in Meditation and answer any questions we had, or offer his solutions to any problems we might be having. On the weekends, after the standard Buddhist ceremonies, he would gather all his students and have a round table lecture where he would further elaborate on Buddhists teachings. The study of Meditation is not easy. Some may think that just sitting quietly is an easy task. But the truth of the matter is that it is one of the most difficult tasks I have ever undertaken. The human mind is most devious. It will trick you, discourage you, and at times encourage you, so you will think you have attained something and foolishly quit the training. For those who may not have a great deal of limberness in the legs the physical pain of sitting in a full lotus position is at times more than the body can stand. This was one of the most common complaints of the students, as their legs would go numb or scream out in pain. Sitting without any movement is without question a monumental task. Students often gave up and started to move in their sitting postures. They would feel an itch that had to be scratched or a pain that had to be attended to. The Master often warned this would happen and that when it did happen we should ignore it. But alas, the itch or pain usually overcame the best of students. At times I would glance at the Master and notice he was like a dead man sitting. There was no movement at all, no facial expression, and even his breath seemed to have stopped. He looked so peaceful you would think he could sit there the entire day and night and love every minute of it. This would drive the students crazy, as we struggled with the agony of maintaining the posture and fighting the mind. The Master would tell us not to fight, but simply to let it all go and observe the mind, without being caught up in its ramblings. This may sound easy, but anyone who has tried it knows that it is not. It was quite something to realize how much control the Master had over his mind and body. It took me years of study to attain some degree of body and mind control. The Master had taught many methods of meditation. Watching the breath and freezing the thought are among the many he taught. However, any method is but a tool to use in attempting to come closer to the practice of pure Ch'an mediation, which is a method-less technique. Until a student attains some kind of control, this method is hard to understand and utilize. The Master understood what we all felt, the pain and disappointment of failure with methods, but he always encouraged us to continue. He was a kind Master, always smiling, with a face that almost seemed to shine with enlightenment. When you saw the inner peace and spiritual awakening he had attained, it drove you to train even harder so that you could share in the wonderful feeling of peace that we all want in this world of hardship, suffering, and pain. Understanding the root of suffering will not alleviate it. However we can learn to stop creating illusions that amplify that pain and cause further suffering. Buddhism advocates the Eight-fold Path as a way to lessen our pain: Right Speech, Right Action, Right Livelihood, Right Concentration, Right Mindfulness, Right Effort, Right Understanding, and Right Thought. Buddhism teaches us to live in a world filled with pain and sorrow. It gives us a way to deal with our everyday lives and to become better able to live in peace and harmony with others. It makes us aware of the impermanence of everything and lessens our desires to attempt to attain anything of lasting value in this life. With an attitude like this we don't take matters of the world too seriously. With this viewpoint nothing is taken to the heart, where it causes pain. We simply learn to live and let live, love our follow man, and share all we can to help others. This same code is contained within the martial arts experience, for the study of the arts contains Buddhist and Taoist concepts of harmony with self and harmony with the world. But what is Buddhism? In simple terms Buddhism advocates the Four Noble Truths. Let us look at two and see how they pertain to martial arts. 1. Life is suffering -- Pain, old age, sickness and death. Buddhism existentially looks at how life is not perfect, because of the disappointments we suffer, as well as dissatisfactions we experience. By understanding all this we are able to overcome and persevere in our undertakings, including martial arts training. 2. Suffering is Caused by Attachment -- Everything is in a constant state of flux. By understanding change we come to deal with Impermanence. Attachment brings with it a continuous cycle of craving, jealously, ill will, and anxiety. Those in the martial arts know all too well teachers who crave fame. They create and impose ill will on others. The word 'Buddha' means "enlightened" or "awakened." It was applied to the Sakyamuni which means "he who will accomplish." Sakyamuni was not unlike us. He suffered, grew old and died. The difference is that he understood the reason for all of his suffering and did something to change the outcome of his life. Because he understood, life became a chance to evolve and grow. Life became a means to help others see truth. Life became a means to transform his old ways into that of a sage. In our martial arts training we too have the same goals. We may not be monks, but we are aware of the Buddha's truths and the consequence of not correcting our ways. We train to better understand ourselves, and hopefully, find the same Way the Buddha found. This is called the Middle Way, not taking anything to extremes. It is true I have no desire to be a monk, but by studying with monks such as Master Sheng-yen I was able to understand the deepest meaning of my life and what to expect from it. Through my studies with this Master, I was able to calm the storm of emotions, troubles and doubts that rage within the human essence. He, like all the enlightened beings in this world, has a great task set before him. That task is to let all who would listen know that there is a Way out. By moving within the Middle Way we can come to learn truth, and, as they say, the truth will set you free. We can live out our life content with the fact that we are making the best of the situation in which life has placed us. We can live in harmony with this ever changing world and go through our lives prepared for the many changes we will experience. Once the reasons are given for all our suffering we can then understand its causes, and thereby deal with it. "Without Chan meditation we are not really practicing true Shao-lin Kung Fu, we are only practicing moves. Moves come from the memory, Chan comes from the heart."